Yea, both of those coats are awesome. And yea, that girl (and many others on that site) is gorgeous. Holy mother of crying baby jesus! [<:o)] Someone needs to buy this on principle! Too bad it's too small for Mrs. Faust. final price is 468.75 shipped CONUS. Their number is 5123927711. This is a Rick Owens shearling that's cut almost identical to the one faust posted, in a size 38. I just paid 1200 for a Rick Owens, and that price kind of blows my mind to be honest. If it wasn't such a straight up feminine piece I would have tried to make it work. Gorgeous, gorgeous. Maybe Laika would like it? has anybody ever handled the various leathers Rick uses for his jackets? Atelier informed me that they come in a super soft washed calf, a stiff calf leather, and then the stiffest leather which is horsehide. Does anybody have any familiarity with the stiff calf and horsehide, and know how they affect the fit of the jacket? All i've ever tried on were the ultra soft/thin ones. I have the stiff calf on my leather jacket and it's great, not quite as stiff as say, the CCP leathers, but it's a nice in between leather. It also gives it more of a rugged look, which I prefer. The soft ones are exquisite though, if I ever bought another leather jacket, it would be one of those leathers. I saw some very stiff biker jackets from this season - not a fan. Besides with them, the whole idea of bunching up doesn't work well, it would seem, so you'd need to be tall like Casius. Actually like Cas says and Atelier mentioned..RO does have different version of the leather.. .nothing really is as stiff as the CCP leather. The stiff leather for RO.. my problem is that when you touch it if feels like a leather that is made in China(ie the leather comes from China but it is made in Italy), thats where I have issues with the stiff leather. I also have the soft one.. and it was from 2-3 seasons ago called blistered lamb.. and it is truly soft and VERY VERY nice to take travelling with you, because it is light weight, and has the leather look with a shine to it.. and buttery soft... my fave leather so far. wondering if someone has seen this jacket in reality. jj- read a few pages back, I'm pretty sure Albert (Chinorlz) mentioned seeing it and that it's maybe one of the best jacket buys from RO. I'd love to check it out too, hopefully someone picks it up in the States. yeah they have it at RO Paris (well... they did about 3 weeks ago) and it is definitely one of the best buys this season! I don't know why it's so inexpensive. It's a very large and substantial jacket.... probably one of the nicest "deep winter" coats I've seen around! well i'm happy to announce that I have finally joined the Rick Owens club. I originally bought a soft washed calf black jacket from matches, but it came with holes in it so that got returned. They had a stiffer rick owens in stock in an olive color, so I went ahead and grabbed that one to see if it was any good. As someone who's handled both, I must say that both jackets are equally phenomenal. The soft black calf leather was unbelievably soft and fit like a sweater, and would have been ideal in traveling environments. However, this new stiff calf (or horsehide?) jacket is pretty unbelievable. The leather has much more texture and substance to it than the softer version, and to my surprise doesnt feel like a cheap made in china leather at all. It has a phenomenal sheen and really rich depth of color to it. The sleeves actually still bunch up, but looks way cooler because it holds its shape even when you take it off. It looks unbelievable zipped up (i kind of looked like a sausage in the soft calf) because its more structured (and SLIGHTLY more forgiving in the chest). When I wear it up it is very reminiscent of some of Carol's stiff structured pieces. My favorite part of the jacket is the quality of the leather used. 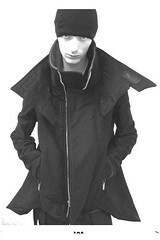 The back is one SOLID piece of leather with 4 darts that shape the jacket. The front panels are two solid pieces of leather joined by the zipper, and the sleeves are formed by two long pieces of leather sewn together at the ends. It has MINIMAL detailing, but yet the fit is fabulous and looks incredible. I've owned various leather jackets and this one has got to be my favorite. Thanks for introducing me to such a great designer SZ. Mike, I'm sure you'll find it there! It's a nice and simple looking jacket, I like that. Also digging the neckline on it. Good choice, mike. The jacket is perfect, simple, but the quality of leather speaks for itself, and the nice steel chunky zipper gives it just that tiny little extra something that will turn people's heads (sometimes even without knowing why).